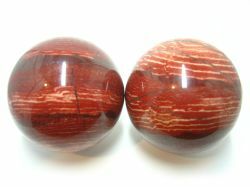 Snakeskin jasper consists of swirls which may range in colors on typically a red background. The red color is a result of iron inclusions. In general, jasper was used by kings and shamans for their metaphysical properties. It is believed to promote justice and responsibility, protect from danger, negativity, and temptations, and boost self-esteem and productivity. It also is believed to protect against psychic attacks. Some use this stone during meditation to clear the mind. Comes in a velour pouch. Colors may vary.